Folks love their samurai-inspired crimefighters seeking to keep the peace. Folks especially love Rai #1 as a samurai-inspired peacekeeper, as Rai #1 from Matt Kindt and Clayton Crain has proven so successful that it's moving to a second printing. A second printing – with a new cover featuring Crain's stunning, digitally painted interior art – is now scheduled to arrive in stores June 4th, alongside the series' next issue, Rai #2. RAI #1 Smashes into First Week Sell-Out; New Printing in Stores with June's RAI #2! 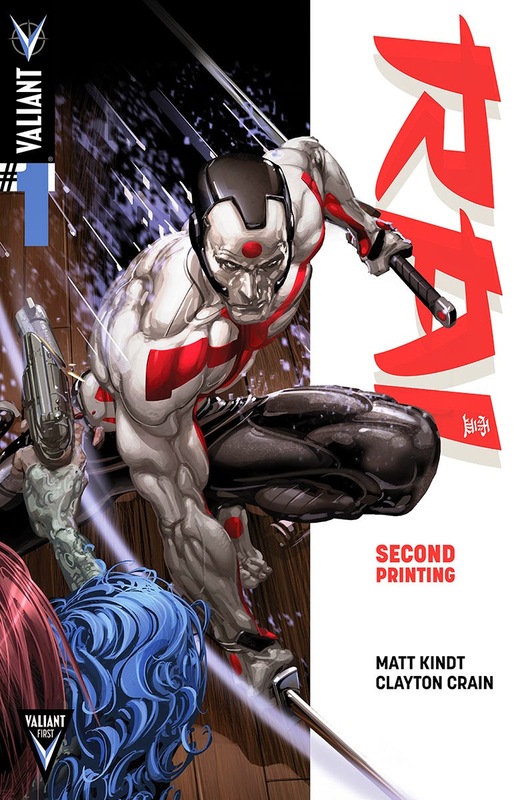 Valiant is proud to announce that RAI #1 – the debut issue of Valiant's newest ongoing series from New York Times best-selling writer Matt Kindt (Unity, Mind MGMT) and superstar artist Clayton Crain (Carnage) – has rocketed through its 36,500 copy print run and is now completely sold out at the distributor level. A second printing – with a new cover featuring Crain's stunning, digitally painted interior art – is now scheduled to arrive in stores June 4th, alongside the series' next blockbuster issue, RAI #2.